Lehi Utah Home for Sale. This Home is SOLD. Buy a Lehi Utah Home | This Lehi Utah Home is SOLD! Lehi Utah Information: Known as the Pioneer City because of its early date of incorporation, Lehi is an attractive residential community based largely on farming, manufacturing, and trade. With a median age of 23.6, Lehi has the "middle-age" residents in Utah County, and with an average household size of 3.58, has smaller families than much of the county. During the last decade, Lehi experienced a phenomenal increase in population, growing from 8,475 residents in 1990 to 48,717 in 2011. Interior Feat: Range Oven Free Std. Remarks: See 50+ Photos of This Home* Click Tour at Top of Page* NEW HICKORY HANDSCRAPED WOOD FLOORS* ALDER KITCHEN W/ ISLAND* NICE DOWN FROM PARK* EASY TO SHOW! 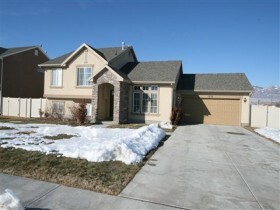 Lehi Utah Home SOLD.